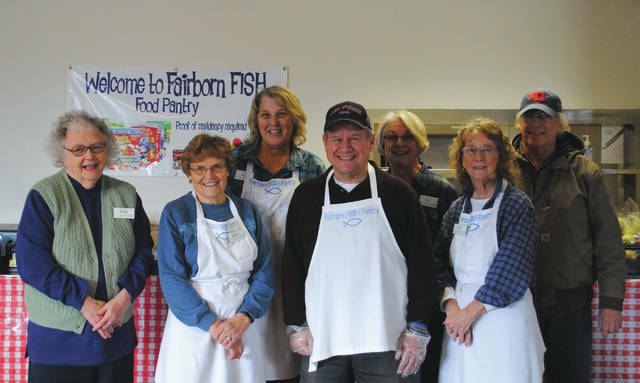 Whitney Vickers | Greene County News Fairborn FISH Food Pantry volunteers, who are from “every church in town,” officials said. Clients are taken toward the back of the facility and are given a shopping cart before selecting items themselves with the help of volunteers. Food is categorized and placed in various areas of the facility. The “prayer table,” where individuals can fill out slips of paper anonymously as a prayer request. FAIRBORN — When an individual walks into the Fairborn FISH Food Pantry, they are greeted, given a paper bag and asked for some information before walking toward the back of the facility to fill their own grocery cart with items they select themselves. The volunteers say that in giving clients the opportunity to select food themselves — just as they would at a grocery store — they are given more dignity and the feeling of a community, which is exactly what FISH officials hope for. They start with selecting canned goods, pastas, rice and meat, before choosing between various breads and miscellaneous items that are available. They finish off their selection with donated desserts. 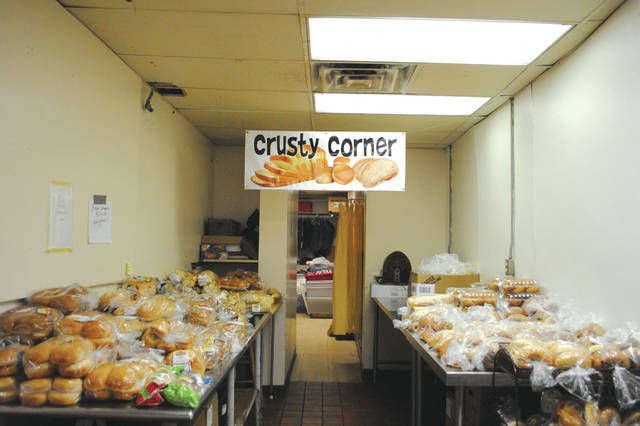 The pantry assisted 25,000 individuals last year with the help of local businesses, citizens and churches. 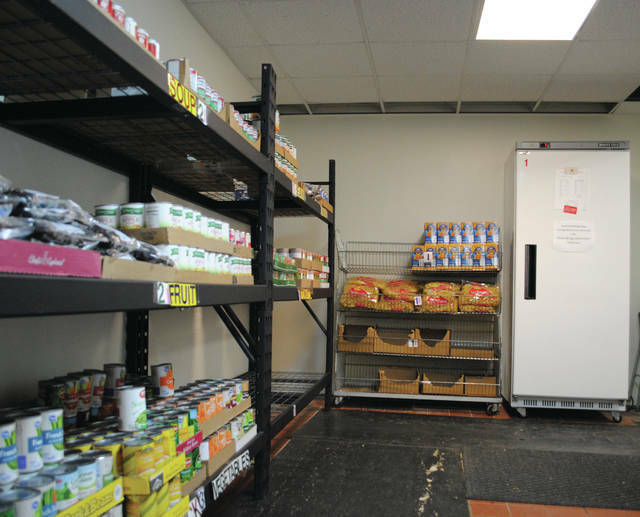 The facility, itself, is owned and donated by First Baptist Church of Fairborn, which sits behind the Fairborn FISH Food Pantry; the carts are from Kroger; the breads and desserts are also from Kroger as well as Panera Bread while some of the other food items are from Bob Evans, City BBQ, The Dayton Foodbank and food drives hosted by a number of Fairborn businesses and churches. In the fall, Fairborn City School students hosted a food drive that resulted in approximately 20,000 pounds of donated food. Volunteers Bill and Jane Doorly, who spearhead the efforts, highlighted that in the summer, some individuals and churches will even donate produce grown directly from their gardens. But it’s not just food individuals can get from the pantry. Jane Doorly highlighted that once per month the pantry receives birthday bags with items such as cake mix, frosting and candles from a donor. It also receives bed padding from individuals who hand-make them from grocery bags as well as from a Beavercreek quilting group, which stuffs personal care items inside the donation. Individuals are also able to turn to the pantry for furniture and referrals to other organizations designed to help those in need. Just by the door is a “prayer table,” where individuals can fill out a slip of paper and place it inside a box as a prayer request. The slips of paper are taken out of the box and are then prayed over anonymously. But sometimes, Davoli said, clients are ready to pray on the spot. The Fairborn FISH Food Pantry is at 1149 N. Broad St. and is open 2-4 p.m. Tuesdays and Fridays. Donations can be taken 1 p.m. Tuesdsay or Fridays or by appointment. To volunteer, call 937-902-5393.
https://www.fairborndailyherald.com/wp-content/uploads/sites/50/2018/02/web1_fish1.jpgWhitney Vickers | Greene County News Fairborn FISH Food Pantry volunteers, who are from “every church in town,” officials said. https://www.fairborndailyherald.com/wp-content/uploads/sites/50/2018/02/web1_fish4.jpgClients are taken toward the back of the facility and are given a shopping cart before selecting items themselves with the help of volunteers. Food is categorized and placed in various areas of the facility. https://www.fairborndailyherald.com/wp-content/uploads/sites/50/2018/02/web1_fish3.jpgClients are taken toward the back of the facility and are given a shopping cart before selecting items themselves with the help of volunteers. Food is categorized and placed in various areas of the facility. 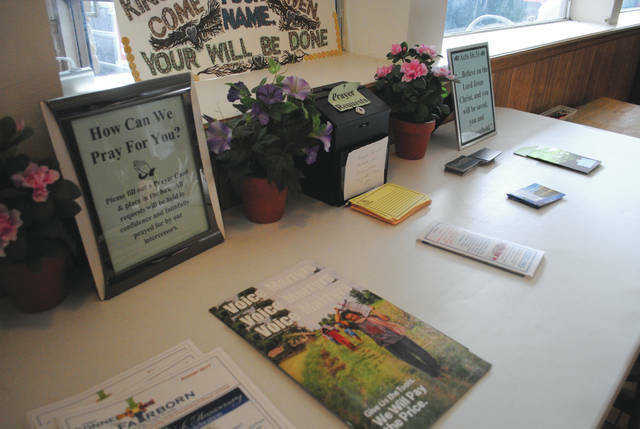 https://www.fairborndailyherald.com/wp-content/uploads/sites/50/2018/02/web1_fish2.jpgThe “prayer table,” where individuals can fill out slips of paper anonymously as a prayer request.